Samsung Electronics is always on the edge of the burning technology (also in the printing industry). Recently, it unveiled its innovative concept printers for homes and small offices at IFA 2014 (the global trade show for consumer electronics and home appliances, taking place in Berlin, Germany, every year, and gathering key retailers, buyers, and experts from the industry and the media from more than 100 countries). What’s brand new about the Samsung printers? They casing is of broad variety of bright colors, they possess unconventional shape and ultimate nature-friendly features (like the opportunity to print on a recycled paper). They are “…simple, mobile and quick to use (according to Seungwook Jeong, principle designer of printing solutions at Samsung). They very much support of the trend for the mobile printing. “One & One” – a mono laser printer with a hybrid design using only to 2 colors. It’s up to the customer to choose the complement cyan, magenta or yellow cartridge to the standard black one. 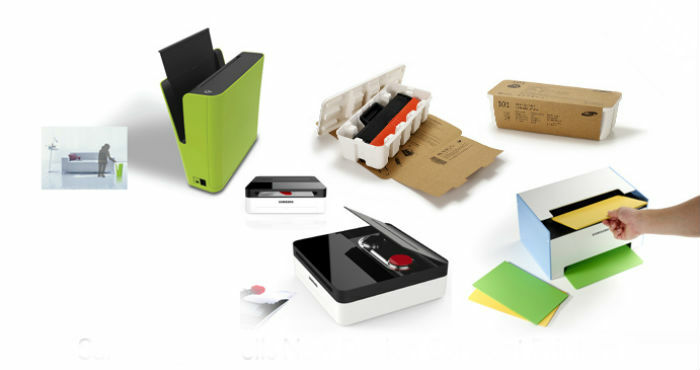 “Mate” – a mono laser printer with a casing of different colors, which could be easily customized by the user. This entry was posted on Tuesday, December 9th, 2014 at 8:56 pm	and is filed under innovation, Samsung. "Brother Multifunction A3 Inkjet Printers For Home Use"